Subtlety is often something of a lost art when it comes to computer games. They are a medium of extremes that often cater to the low attention span. It’s often easier to bludgeon a point home as hard as possible than risk the player missing out on a key piece of the plot, especially in an environment increasingly made up of sand-box titles where scripting a decent narrative has become immeasurably complex. Recently the concluding part of the Arkham series of Batman games managed this quite well, but for every success there’s a full dozen failures. RPGs for the most part come off light where this is concerned, largely because the story tends to be the main draw of such a genre. That said, there are still plenty of examples of plot twists being telegraphed from the outset, or of characters destined to betray the player’s trust being designed and illustrated in such a manner as to make them unlikable from the start. Subtlety then is to be treasured. Suikoden II juggles a large cast of 108 characters and frames itself around the struggles of the player, his best friend and his sister as war and politics threaten to tear the three of them apart. It’s a game of epic sweeping battles and betrayal, but also one of romance and relationships. Suikoden II manages to present several touching romantic stories alongside personal tragedies and other high-impact storytelling devices, all as optional content assigned to characters many players won’t be spending much time around and could never even put into their party. A good example of this is the player character’s love interest, a character who most people would be able to play the game through from beginning to end and miss this motivating factor entirely if they weren’t paying attention. This plot thread only serves to deepen the understanding of a few sub-characters unessential to the main story and leaves many characters, including the player character himself in many cases, unaware of what is happening. I am of course referring to Eilie. 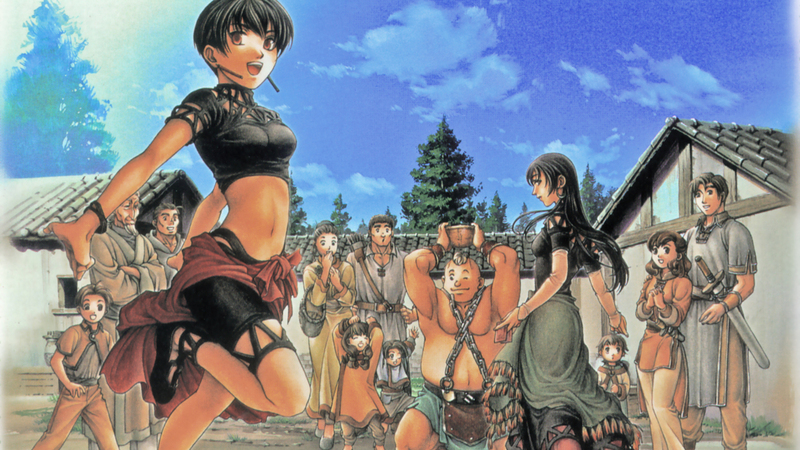 Eilie and her family as depicted in official artwork. Early in the game the player encounters Rina, Eilie and Bolgan. Three siblings of a Romanic-like background who travel the world together as a circus act, putting on a show in each town they pass through. Rina reads people’s fortunes, Eilie is a knife thrower and Bolgan is a fire eater. They are carefree and for the most part unbothered by world politics. A chance encounter between them and the player party turns them into allies of circumstance as together they can travel through an area too dangerous for either side to do so alone, and the two parties part on good terms. Later they can be drafted into the player’s army and here is where the more subtle interactions begin to emerge. Eilie is often the first person to respond in crowd scenes in the defence of the player, or immediately commenting after his sister makes her opinion known. This by itself is harmless, although more frequent if you include Eilie in your party. Coupled with comments made by other characters about her or to her in confidence however the evidence of her falling slowly in love with you becomes more apparent. Rina flirts with you subtly but largely teases her sister about you. Sheena, a highly sexualised male character can be found hanging around watching Eilie at certain points in the game and implies that he’s interested if nobody else is going to make a move. 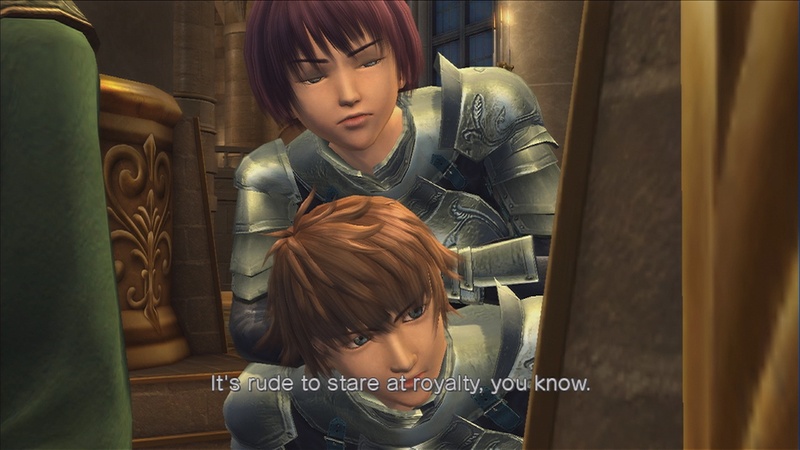 Ultimatly this budding romance amounts to nothing as the lead character is too busy to really notice what is going on and more concerned with leading an army that romance. This leaves Eilie at the games conclusion with only her family, returning to her wondering ways, although she ‘often thinks of him fondly’. Leonard comes across more than a little needy. 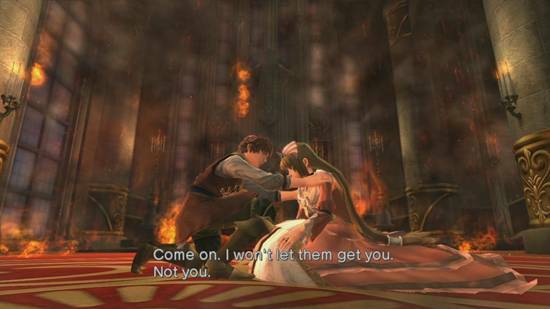 Comparatively you have games like White Knight Chronicle where the lead character (a teen called Leonard) is hopelessly besotted with the princess of his kingdom without ever having met her, and when he finally does so immediately dedicates his life to trying to save her from what occurs after. This is all the more aggravating because his best and most supportive friend is a girl called Yulie, who is also obviously in love with him. She joins up on a dangerous adventure to support him, going through ordeals in the sequel to earn an Incorruptis of her own and rescue him on one occasion. Conversely, the princess plays the role of damsel in distress throughout. As tradition dictates, Leonard is unaware of Yulie’s feelings to the point of being borderline annoying, and the series never brings a resolution where he does so. Instead he remains infatuated with the princess to the games conclusion – which I won’t spoil here. The difference is subtlety. Leonard declares his love for his princess in every other comment whilst Eilie never speaks out in any manner, simply being supportive and there for the player in his low moments without prompting. It shows that good solid writing should be the cornerstone of every character’s dialogue and that ultimately we as an audience can be shown something without having a particular plot point beaten to death.